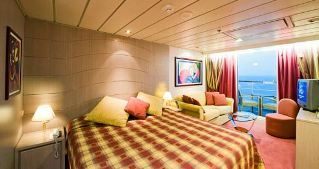 The MSC Lirica is known for its traditional and more elegant ambiance. The ship travels to destinations in South America, Eastern and Western Mediterranean. Christened by Sophia Loren, launched in the Spring of 2003 and the first ever new build cruise ship to enter service for MSC Cruise - the Lirica is a sister ship and the same size and shape as the MSC Sinfonia, MSC Opera cruises (which South Africans are familiar with) and the MSC Armonia. To check availability and pricing for your cruise booking on the MSC Lirica, please complete the form below and we will get back to you with a quote as soon as possible. (Email cruises@southafrica.to if you're experiencing difficulties). There are currently no cruises available. Please check again soon. Watch this video of a cruise from Venice and tell me you don't want to go (if you do want to go, navigate to our MSC Mediterranean cruises page)! 17 June 2013 : Video footage of an MSC Lirica cruise from Fort-de-France to Pointe-a-Pitre, St John's, Santo Domingo, La Romana, Philisburg & then back to Fort-de-France. 7 April 2013. Another stunner of the MSC Lirica leaving the Port of Piraeus. 2 April 2013. The MSC Lirica cruising from Piraeus. Nov 2018. The MSC Lirica visits the UAE. 19 Nov 2016. The Lirica moves to Dubai, offering cruises in the middle-east and to India. The routes are: (1) Dubai to Abu Dhabi, Sir Bani Yas Is, Doha, Bahrain, Khasab, Muscat and then back to Dubai; (2) Dubai to Abu Dhabi, Khor al Fakkan, Mumbai, Goa, New Mangalore, Muscat and back to Dubai. 31 Aug to 9 Nov 2015 The Lirica goes into dry dock to be lengthened and 200 cabins added, as well as water features and shops. She is the last of the Lirica class ships to have this operation performed, after the MSC Armonia, Opera and Sinfonia. Whilst at dry dock the ships are being fitted with lego-themed playrooms. 21 Nov 2013. The MSC Lirica is welcomed to Port Sultan Qaboos: "“The ship has the capacity to carry around 2,000 passengers. 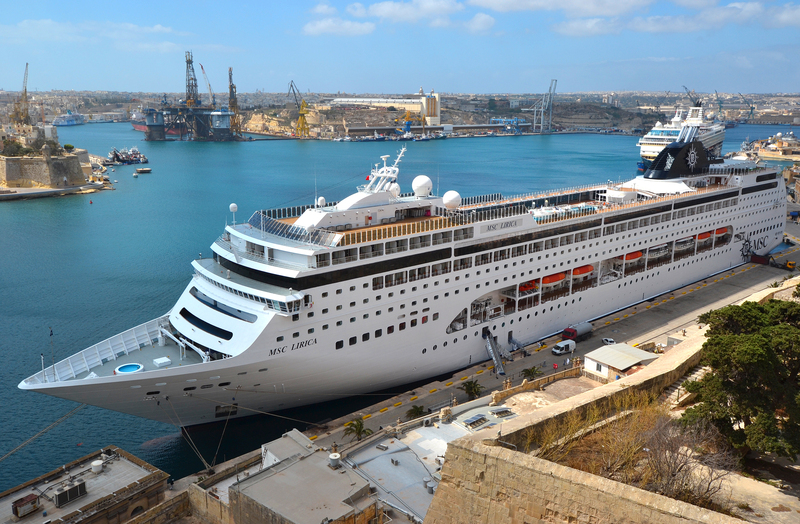 We are happy to have cruise liners like the MSC Lirica visiting Oman to develop potential tourism. This will help us put Oman in a new position at a global level. We would like to continue the coordination with each other." said Ibraheem al Mahrouqi, a Ministry of Trade official. 9 April 2013. Video of a Lirica cruise from Salerno to Tunisi, Palma, Marsiglia, Ajaccio, Genova and Civitavecchia. 19 Dec 2012. The Lirica commences cruises from San Souci, Santo Domingo. 6 Dec 2012. An early discount special for bookings on an MSC Lirica Easter Cruise in the Black Sea and the Mediterranean. 5 Nov 2012. The MSC Lirica cruises into Piraeus, Greece. 24 Nov 2012. The Lirica cruises into Port Yalta, Ukraine. With technical specs nearly identical to the MSC Sinfonia, you are guaranteed the same luxurious surroundings, fabulous entertainment and delicious food. There will be approximately 700 crew members waiting to tend to your every need and there will be approximately 1500 other passengers on board. 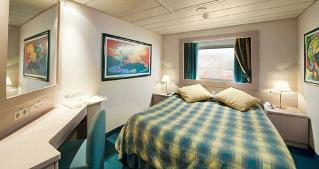 With only 780 cabins onboard, you can be sure of excellent service! Inside cabins consist of single beds which may be converted into double beds (except in cabins for the disabled), spacious wardrobe, a bathroom with a shower, a mini bar, safe, an interactive TV, telephone and air conditioning. Size is some 13 square metres. Ocean view cabins are the same as inside cabins, but have a view of the sea. 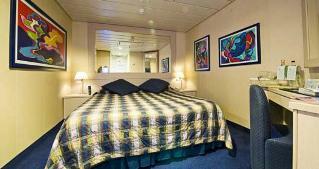 Balcony suites have a double bed & a bathroom with a tub. There is availability of internet connection using your own laptop (on payment). It is some 28 square metres in size. If you've ready all the way down to here you are hopefully ready to go for your MSC Lirica cruise - if not, say hola and pop us a question using the form below or email cruises@southafrica.to (please use same email addy to email us any cruise photos you take...we LOVE receiving them). Ciao.